Aside from our state-of-the-art facility and our fantastic views, one of the biggest things that sets Rocky Top Sports World apart from all the other youth sporting complexes in the country is our close proximity to so many fun and exciting things to do. Not only are we neighbors to the most popular national park in America, but we are also just down the street from a ton of thrilling Gatlinburg attractions that visitors will love to enjoy after spending the day competing. For an example of just a few of the many Gatlinburg attractions near Rocky Top Sports World, continue reading! Sure you can test your physical limits on the playing field, but why not unleash a whole new set of skills by trying your hand at one of the many outdoor adventures found at ClimbWorks in the Smoky Mountains. Whether you want to try your hand at zip lining, mountain biking, or both, visitors to this Gatlinburg attraction near Rocky Top Sports World are guaranteed to return home with a new sense of confidence and appreciation for the natural beauty of the Smoky Mountains. Location: 155 Branam Hollow Rd., Gatlinburg, TN. Hours: 7 a.m.- 9 p.m.
For an example of the exciting zip line experience that you and your team can find at ClimbWorks, please watch the video below. Ripley’s Aquarium of the Smokies is one of the most popular Gatlinburg attractions near Rocky Top Sports World. Home to over a thousand unique aquatic wildlife, including 12-foot sharks a giant sea turtle, and several playful penguins. Where else in Gatlinburg can you find shrunken heads, an authentic vampire killing kit and a vortex tunnel? If you are a fan for the creepy, the crawly, and the downright strange, then you and your group will have a blast at this exciting Gatlinburg attraction near Rocky Top Sports World. We have all ready the books, and now it is time to see the records come to life inside the Guinness World of Records Museum. Here is where you and your group can find memorabilia from all the top records, including ones from Michael Jordan, The Beatles, Elvis and more! Experience a trip to the movies like never before by visiting Ripley’s Moving Theater in Gatlinburg. Here, guests will feel as if they are actually part of the film as they dip, bump, and shake along with the movie. With Halloween just around the corner, why not spice up your next trip to Gatlinburg by adding a visit to Ripley’s Haunted Adventure onto your travel itinerary. Home to everything that goes bump in the night, this Gatlinburg attraction near Rocky Top Sports World is just what your team needs to bring you closer together before the big game! 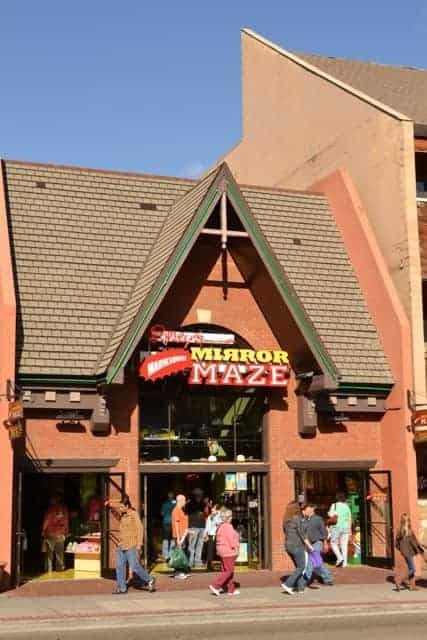 At Ripley’s Marvelous Mirror Maze, you and your team will work your way through a labyrinth of mirrors as you try to find your way to the only exit out of the maze. You can consider this a team bonding experience as you try to figure out which way to turn. The trick to this Gatlinburg attraction is to not get lost in your own reflection. Made up of not one but two exciting putt-putt courses, the Ripley’s Davy Crockett’s Mini-Golf course is just what you and your team need to unwind after a fun-filled day of competition at our Gatlinburg Sports Complex. Located direction on the Parkway, this Gatlinburg attraction is just steps away from several delicious restaurants and local shops that you can visit to round out your vacation experience. Not to mention, your scorecard will make a great souvenir to remember all the fun times you had in the Smoky Mountains this fall. To help you save some money when purchasing your tickets to thie Gatlinburg attraction near Rocky Top Sports World, be sure to include the code ‘ROCKYTOP’ when completing your order. This will give you $3 off adult admission and $2 off childrens’ tickets to all 8 Ripley’s Tennessee attractions. Not valid with any other discount. Looking for other fun things to do and places to eat in the Smoky Mountains? Be sure to check out Rocky Top Sports World’s Sponsors page for a list of all the best Smoky Mountain businesses located near our Gatlinburg sports complex. This entry was posted in Our Gatlinburg Sports Complex on September 5, 2014 by rockytopsports.